Family Friendly A short spur to a breathtaking overlook of the Mammoth Terraces. This short spur provides a nice overlook of the Lower Mammoth Terraces and Minerva Spring, named for the Roman goddess of artists and sculptors. Interestingly, a number of springs in the Mammoth area are named for Roman gods, like Minerva and Jupiter Terrace. Minerva Spring is a favorite not only because of its wide range of bright colors but also for its ornate travertine formations. Since the 1890s, when records were first kept on the activity of Mammoth Hot Springs, Minerva has gone through both active and inactive periods. For several years in the early 1900s, it was completely dry, but by 1951 reports state that Minerva was again active. In recent years, hot spring activity has shifted dramatically from Minerva to other features on the Lower Terraces, and back again. During some cycles of activity, water discharge and mineral deposition have been so great that boardwalks have been buried beneath mounds of newly deposited travertine. Consequently, an elevated and movable boardwalk now spans the hill in the vicinity of Minerva. 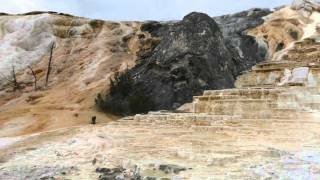 Trip video exploring Mammoth Terraces.